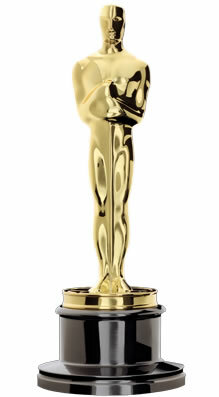 Don’t let the Oscar stand in that position for four long hours. Someday, a poll has to be taken on how people perceive the Oscar telecast and all of its sometimes tedious three (or four) hours. Do people really enjoy watching it straight through with interest in the details, or do they just have it on as a pop culture event not unlike the Super Bowl? In that regard, the Oscars might really be defined as party wallpaper for an excuse to invite friends over and empty another half-dozen Doritos bags into a giant bowl of salsa dip. But if it’s the other way around, there probably isn’t a single person on earth who sits through the entire show. As much as the show tries each year, and despite producing team Craig Zadan and Neil Meron bringing a classy production the last few years, the Oscars simply can’t seem to end without going well over three hours at the very least. Brevity in any kind of entertainment is becoming more sought after than ever, with proof through shortened TV seasons, six-second marketing videos, and bite-size episodes of Netflix shows bringing in the masses. What would happen if the Oscars ever managed to realize that a bloated telecast just isn’t going to cut it for future audiences? What if they dared to make an Oscar show only an hour with merely the essentials? Let’s take a look at what would potentially be left in and, ultimately, the majority of what’s taken out. If Neil Patrick Harris becomes the next Billy Crystal at the Oscars, you can be sure the opening will never change in length. The only exception is if the Oscars suddenly decide that dramatic actors or even other media figures need to host for diversity, despite being unblessed in reading teleprompters effectively. If this happens, you’re assured the opening monologue or any comedy bits would have to be shortened to only five minutes. That’s because the talented writing teams always present the weakest hosts with at least one sizzling joke for the first few seconds. One thing that should never change: An opening musical number. As we’ve seen with straight-up comedian hosts without singing or dancing talent, the opening monologue sometimes feels like a late-night show guest host filling in for the real host who has the flu. This isn’t to say they couldn’t force a dramatic actor or more serious individual in pop culture as host to sing and dance in a comedic way. Even Neil Patrick Harris frequently has tongue-in-cheek while in musical mode. Then again, Twitter would have an implosion record if someone like Meryl Streep or Matthew McConaughey decided to sing and dance while hosting. This can’t mean flying over the audience on a wire, or it risks tacking on five valuable minutes. In today’s culture, you have to hook people with something great early and not expect everyone will wait an eternity to see what they really want to see. While the supporting acting categories are always worth watching, there usually isn’t any surprise with those wins. And Best Supporting Actor is always the first award presented of the night. For an hour show, Best Director, or even one of the lead acting categories, should be given first. This sets off buzz on social media, plus a chance for your Oscar partygoers to stave off cleaning out the bowl of guacamole dip in the first 20 minutes. It also sets up more suspense about who will win the opposite gender acting award later in the hour. Yes, this hints that Best Actress is more important to the public than Best Actor. Let the Best Actor go relatively first, with a major award following a minor award every 10 minutes to keep everyone from turning to The Walking Dead, now in it’s 15th year within our imagined future. Do we really need extra time tacked on for a summary of every Best Picture nominee? You can add an extra minute because the celebrity they acquired to present it has to walk half a mile across the Dolby Theater stage to reach the microphone. Then we’re treated to redundant clips of the movie that have already been played many times in the media. Of course, they could take risk and have comedic analysis of each film from Will Ferrell and Kristen Wiig. While hilariously high-concept to some, the majority would be staring at their smart TVs with jaws in their lap, covering the last piece of pizza at your Oscar party. If people are really serious about wanting to learn more about the Best Picture candidates, place video summaries of each film up on Oscar.org. While this risks the show perhaps going 1 hour and 10 minutes (still a record short length), the acceptance speeches by the winners are by far more entertaining than any written material. Let the winners say whatever is on their minds for as long as they want considering spontaneity always assures the most memorable Oscar moments. By eliminating unnecessary segments, they already have extra time and won’t feel rushed by that annoying exit music. Obviously, there has to be some limit, so anyone trying to hijack the show after winning would just be carried off by a comedic crew of bouncers. This is a tough one to eliminate because I (and many others) respect this segment every year for honoring the late legends that made the movie industry great. But since every other award show does the same thing, including other media, it’s worth not having it once to make a one-hour show possible. If nothing else, to save time, do a one-minute segment with a large-screen pic collectively showing all the names and faces of those in the industry we’ve lost. One thing you’ll notice with all the In Memoriam segments: We’ve seen so much crossover in show business that many of the notables who pass end up in the same memorial segments on the Emmys, Tonys, Grammys, and SAG Awards. As noted above, the biggest time-waster on award shows is the amount of space that has to be traversed to physically claim an award. The worst offender to this is the Golden Globes that’s now been deemed an official maze based on how many tables an actress or actor has to go around before reaching the stage. It’s not much different at the Oscars where more than a few celebrities trip on their own fashions climbing stairs that look as if they were built for a monument in Ancient Greece. After all, Jennifer Lawrence can only fall on steps so many times before someone hands her the Oscar in the audience. Why not bring the Oscar to the winner and have microphone stands out in the audience so they don’t have to walk a mile? Having the audience of their peers (and family) surrounding the winner would be ideal. You also have more social media action because you’ll see the losers sitting nearby reacting during the winner’s speech. An eye roll from one of them is inevitable. Personally, I get frustrated when I see so many great foreign films and short films win Oscars that few people have even seen. It would be a difficult choice for me if having to choose to eliminate those for an hour-long Oscar show. Regardless, the Oscars should have a pre-ceremony show that’s streamed online for those minor categories so they’re still represented. For television audiences, the presentations of these categories are when most people are off in the kitchen making a sandwich or ridding their beer in the bathroom. Keep in mind that the Tonys have done a pre-ceremony for years that’s also shown online (and even broadcast once on a different network) so the TV broadcast has only the major categories. Conversely, they also aren’t the best example since the Tonys are known for running over three hours themselves. We have to admit that many of the nominees for Best Song seemingly get weaker every year. Great movie music is far and few between nowadays, though you can’t say all the performances of the nominees have been boring on the Oscars in recent years. Unfortunately, some song performances are so dry that they have to resort to offbeat production values in order to gain any attention on the Oscar stage. Some songs are also mundane enough where you wonder why they were even nominated. This gives the notion the academy would have preferred just nominating the one lone standout song from a movie. In an hour show, let only the winner perform after winning the Oscar. This also eliminates any chance of the Oscars being blamed for secretly wanting to be the Grammys, even if they really want to be your next favorite reality show. What Happens if They Run Under the Allotted Hour? All of the ideas above would easily shave off two hours and could make for a smooth one-hour telecast. This isn’t to say that with the attention to brevity and quicker stage logistics, it might run five or 10 minutes behind. With local ABC affiliates probably panicking that they’d have to air infomercials for juicers afterward, the Oscar host would have to be resourceful. One thing that would make an ending of an hour-long Oscar show memorable is having the A-list celebrities in the audience involved in antics onstage. If Ellen Degeneres and her epic selfie last year took things to the stratosphere, why not re-create something done in the 1959 Oscars show? In that broadcast, host Jerry Lewis had to fill time because it became the only Oscar show in history to fall under time. Going with some spontaneous comedy, Lewis brought well over 50 A-list acting legends up on stage to dance their way off the stage. As a result, it turned into one of the most memorable and subsequently notorious Oscar endings of all time. May every Oscar telecast face the same dilemma in the coming decade for its own good.